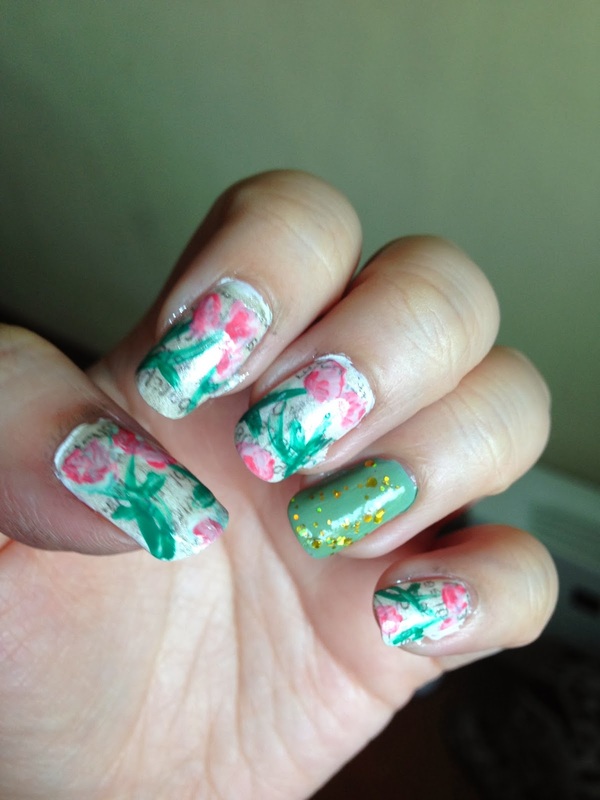 Inspired by +cutepolish as well as another manicurist, I decided to do the above design and might I add that this is the first design in which I drew all the flowers with a brush! I used white followed by OPI whitish creamish glitter so as it give it a slightly more realistic newspaper colour. You can use watered down brown/olive to achieve a similar effect. Then, following the tutorial by +cutepolish I dipped strips of newspapers into alcohol (I used Gin) before pressing them onto the semi-dry nails. It's advisable to use the day's newspaper instead of old ones so that the print comes off easily. Once the print is on the nails, I use that same translucent glitter nail polish to seal in the letters. Wait for this layer to dry before painting on the flowers. While waiting for the previous layer to dry, I painted by ring finger with a light shade of green before adding gold large glitter polish. First, draw on the green stalks with your brush or striper brush. You'll now need a piece of plastic or aluminium foil as your palette. On the plastic/foil, drop blobs of white, light pink and a dark pink. Helps to drop them close to each other so that you can mix them a bit. Mix half of the white with the light pink to give you an opaque pink base. Dip one-third of your brush in the white polish, one-third in the mix and one third in the light pink. Using the top of the stalk as your starting point, paint on the flower, with the darkest shade of pink on the tip of the stalk. Remember to wiggle your brush a little. Finish the flower off with a fine tip brush dipped into the dark pink. Finish it off with top coat.